Just off the southwestern corner of Mauritius (shown at the center of this Overview) is what appears to be an underwater waterfall. In reality, it is just the flow of underwater currents and sand patterns on the ocean floor that form this spectacular optical illusion from the aerial perspective. Mauritius is an island nation in the Indian Ocean, roughly 1,200 miles (2,000 km) off the southeastern coast of Africa. Detroit is the largest and most populous city in the state of Michigan, with 4.3 million residents in its metropolitan area. It is best known as the center of the U.S. automobile industry, housing the headquarters of General Motors, Ford and Chrysler. Detroit is also a major port on the Detroit River, which is shown flowing through the city in this Overview — does anyone know why the river has two shades? A parasail is pulled behind a motorboat on Commencement Bay, just offshore Tacoma, Washington. Average water temperatures here can drop below 45 degrees Fahrenheit (7°C) in January and February, and often do not rise above 55 degrees Fahrenheit (12.7°C) in summer months. Cloud Gate -- nicknamed "The Bean" because of its shape -- is a public sculpture in the center of AT&T Plaza at Millennium Park in Chicago, Illinois. Created by Indian-born British sculptor Sir Anish Kapoor, it is made up of 168 stainless steel plates welded together and polished heavily to remove any seams. It is one of the most visited and photographed tourist attractions in Chicago, receiving upwards of 25 million visitors in 2017. A residential section of northern Ankara, Turkey, is shown in this Overview. Ankara is Turkey’s capital and second largest city (after Istanbul), with more than 5.4 million residents. Historically known as Angora, the city lends its name to Angora wool, which is shorn from Angora rabbits and the long-haired Angora goat – the source of mohair. Printshop Holiday Promo — if you spend at least $150 by December 16th, you’ll receive a complimentary SIGNED copy of “Overview” with your order! This promo applies to US orders only. 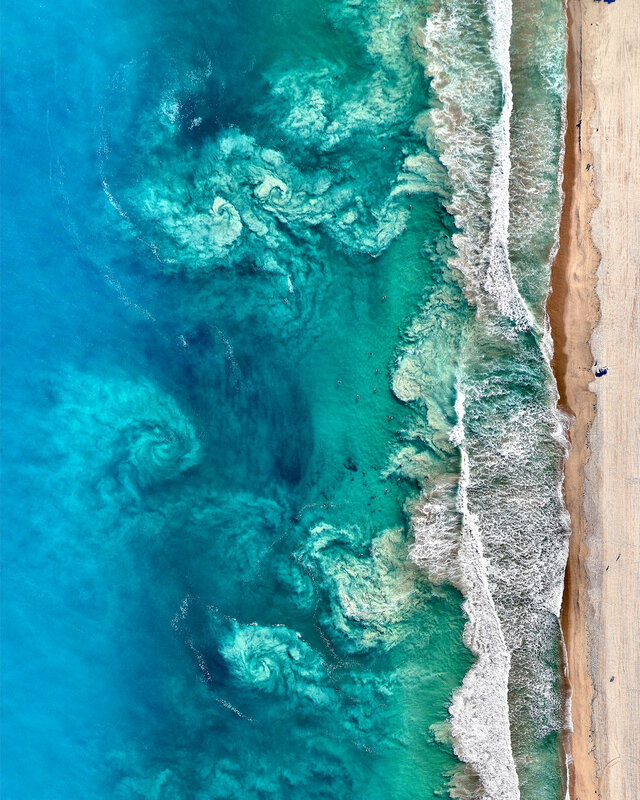 Head over to our Printshop to see what prints are available, including this stunning shot that captures of swirling waves offshore Perth, Australia. The beaches in Perth are world-famous for their beautiful white sand and clear blue water. 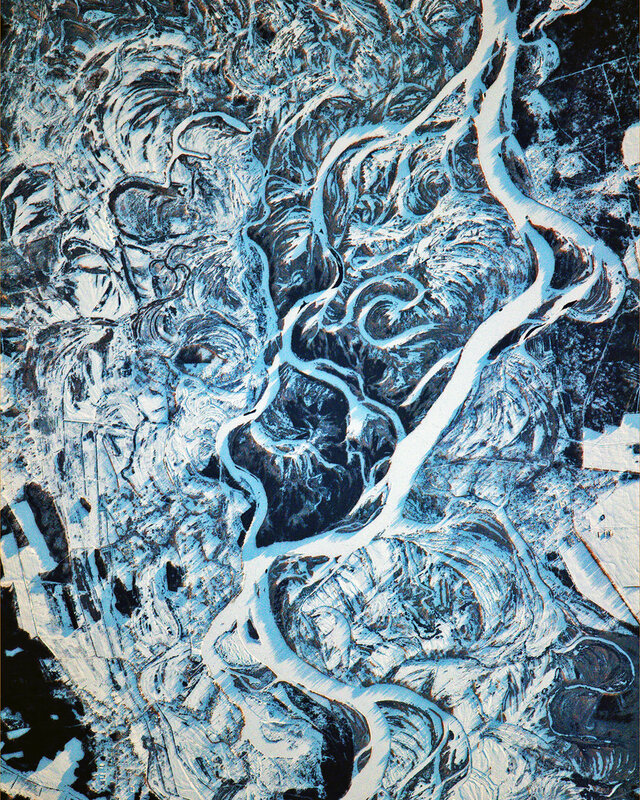 Swirling snow drifts accent the terrain surrounding the Dnieper River, which flows for roughly 1,400 miles (2,200 km) from Russia to the Black Sea. The Dnieper is the longest river in the Ukraine and Belarus, and the fourth-longest river in Europe. This amazing image was captured by European Space Agency astronaut Thomas Pesquet while aboard the International Space Station in February 2017. Kingston is the capital and largest city of Jamaica, located on the southeastern coast of the island. More than 660,000 people live in Kingston's metropolitan area, accounting for nearly one-quarter of Jamaica's total population. The city is surrounded by the Blue Mountains, Red Hills, Long Mountain and Kingston Harbour, which is the seventh-largest natural harbor in the world. Griend is a small, uninhabited Dutch island located in the Wadden Sea, roughly 62 miles (100 km) northwest of Amsterdam. In the Middle Ages, the island housed a walled settlement and monastery, which were destroyed by St. Lucia’s flood in 1287. Later, a few farmers inhabited Griend between the 18th and 19th centuries, but continuous erosion pushed them away — the island remains only 25 acres (10 hectares) in size today. Yellow canola fields are visible across the landscape north of Adelaide, Australia. While various crops are grown here, the canola fields are easy to notice because of their vibrant flowering color. The crop is grown for the production of oil, which is extracted by slightly heating and then crushing the flower seeds. Canola oil is primarily used as a source of biodiesel and also for cooking purposes. A sailboat cruises through a group of massive icebergs offshore Tiniteqilaaq, a small settlement in southeastern Greenland. Also known as Tiilerilaaq, the village has a population of just 134 people and is rather difficult to access, except by helicopter. 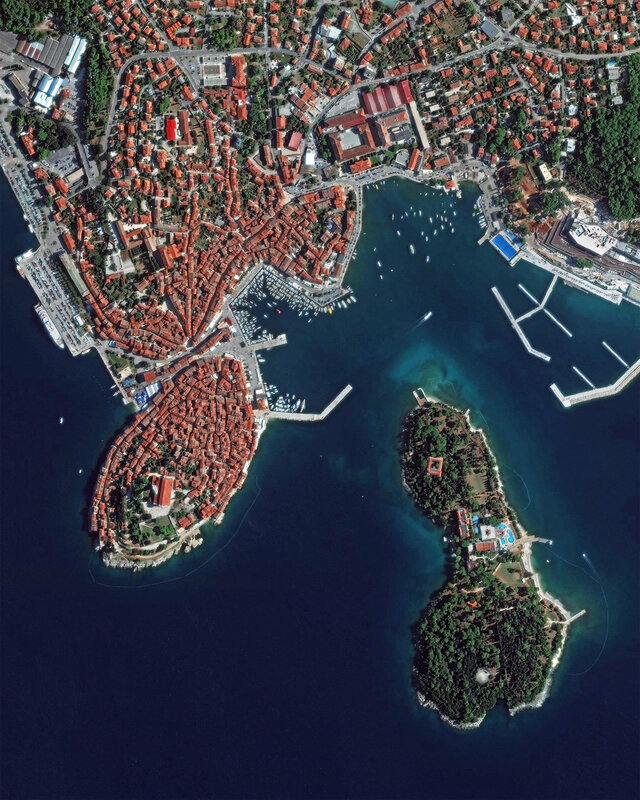 Rovinj, officially known as Rovinj-Rovigno, is a city in Croatia with roughly 15,000 residents. Located on the Istrian Peninsula in the north Adriatic Sea, it is a popular tourist destination and an active fishing port. Most people in Rovinj are bilingual, speaking Croatian and Italian — and a handful even speak Istriot, an endangered Romance language with less than 1,000 speakers left. In this Overview, thousands of cattle can be seen on a feedlot in LaSalle, Colorado -- a small town roughly 50 miles (80 km) north of Denver. This particular feedlot has a capacity for 69,000 cows and is one of several owned by the largest cattle feeding company in the world. Other feedlots owned by company, located in Arizona, Idaho, Kansas, Oklahoma and Texas, have an estimated total feeding capacity of more than 900,000 head of cattle. 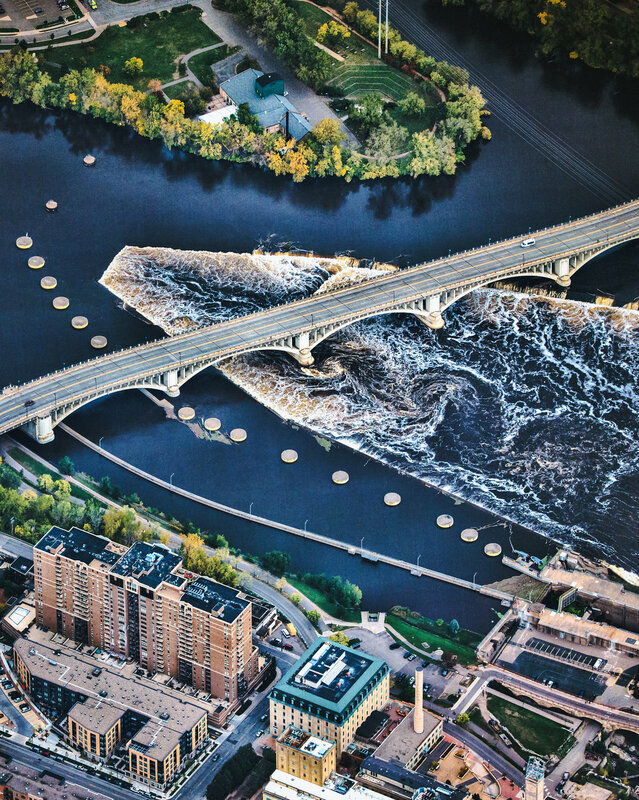 Third Avenue Bridge passes over Upper Saint Anthony Falls on the Mississippi River in Minneapolis, Minnesota. Originally, the Falls of Saint Anthony was the only natural major waterfall on the Upper Mississippi River; however in the 1950s and 1960s, a series of locks and dams was constructed to extend navigation to points upstream. A small portion of the lock system can be seen in the bottom right of this Overview. Surrounding this area is a 1.8-mile (2.9-km) self-guided walking trail with signs explaining the area's history.